“The Life, Times, and Teachings of a Savior” from Christian Faith Publishing authors of the organization, LIGHT is an enlightening book that does not only explore the historical life of Jesus, but also digs deeper into his works, teachings, and biblical events related to him to find esoteric meanings and explain how the sins of mankind fall onto his shoulders. “The Life, Times, and Teachings of a Savior”: a thorough work of deeper discovery upon the one who has saved mankind from their errors. “The Life, Times, and Teachings of a Savior” is the creation of published authors from a nonprofit organization called LIGHT, a dedicated group who promotes the universal light that will generate healing to today’s darkened world. Published by Christian Faith Publishing, LIGHT’s new book is rich in information that is meant for readers who are searching to understand the meaning of their lives through knowing the teachings of the man Yahshua and the knowledge they can get in various biblical events. The study also links the Messiah to Adam, the first man on earth as mentioned in Genesis. Jesus’s fulfilled mission on earth is also proof that one’s God-given life purpose can still be achieved in a world full of sin. View a synopsis of “The Life, Times, and Teachings of a Savior” on YouTube. Consumers can purchase“The Life, Times, and Teachings of a Savior” at traditional brick & mortar bookstores, or online at Amazon.com, Apple iTunes store, or Barnes and Noble. 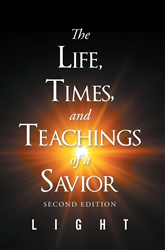 For additional information or inquiries about “The Life, Times, and Teachings of a Savior”, contact the Christian Faith Publishing media department at 866-554-0919.